In our new digital world, the balance of power has shifted to the consumer. Product research, reviews, price comparisons, and more await just a click away. We’ve seen this instant access transform entire industries: Who needs a travel agent when you can book your whole trip – flight, car rental, hotel – right from your phone? The internet as a means for reaching and converting consumers has never been more effective. Younger families are not responding to the same delivery channels that worked on their parents and grandparents. So how do individual carriers help lead the evolution of the industry, rather than fall victim to it? It starts with tailoring outreach to meet consumers where they are. Traditional demographic considerations – race, gender, age, etc. – are not enough; to reach marketing and sales goals, insurers must view consumers as human beings, not just a collection of demographic data points. While both the amount of available data and computing capacity are rapidly increasing, insurers continue to struggle with meaningful consumer engagement. Much of the problem can be attributed to reliance on outbound (aka “push”) marketing and sales campaigns still using outdated methods. Inbound (aka “pull”) marketing is changing the way forward-looking carriers communicate with clients. Inbound marketing starts with a unique “hook,” typically in the form of engaging web content, including articles, infographics, social media posts, video and more – all carefully tailored to drive qualified leads to the insurer’s website. To be effective, such content cannot be created in a vacuum; insurers must connect with individuals on a deeper level to acquire and retain customers. This requires insurers to gain an in-depth understanding of each current or prospective policyholder’s needs, to personalize a marketing appeal to address those needs, and to develop content that leads or “pulls” customers through a purchasing process that extends from awareness to action. This process occurs almost entirely digitally and is transforming the way insurance is both sold and bought; only the most agile will be able to cope with these rapid changes and newer challengers. How can insurance marketers gather actionable information about potential customers, develop relevant and engaging marketing messages, and break through the noise? Insurtech may offer a solution. 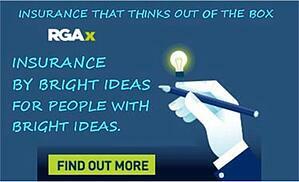 Consider rLinkage, a marketing platform developed by RGAX, RGA’s industry transformation engine. rLinkage works by linking new forms of data with proven technologies in a centralized marketing hub. The platform is flexible and scalable, enabling insurers to adapt as big data pervades the competitive environment. rLinkage works by putting archetypes into action. A concept originally developed by the psychologist Carl Jung, the archetype in marketing refers to a collection of qualities or preferences associated with a group of target consumers. Each group shares a set of characteristics and preferences and may respond to a very specific set of marketing strategies. Marketing to this archetype could be personalized to look something like this. Outreach to individuals in this group might be adjusted to resemble this. The difference is clear, as is the opportunity. Initial results with rLinkage are already demonstrating significant potential: Marketing campaign performance rates have, according to internal reporting, improved up to two times across channels, including social media and marketing automation email, text, and ringless voicemail. Most life insurance acquisition campaigns follow a “one and done” approach: Reach out, and if a lead doesn’t convert or make a purchase, move on to the next one. Even campaigns that do re-target individuals usually do so in a generic, one-size-fits all manner. rLinkage, on the other hand, employs a digital assistant named Emily to get to know prospects on a more personal level. Emily asks questions, monitors responses and other behaviors, and tailors future communications accordingly. While digital assistants are now becoming common at the existing policyholder customer-service level, rLinkage moves this technology to the front of the insurance value chain and then follows consumers through the entire customer journey. According to LIMRA, an estimated 58 million households lack adequate insurance coverage in the U.S. alone, and 80% of people overestimate the cost of insurance. The disconnect is clear–as is the opportunity. Bottom line: Today’s consumer expects to be treated as an individual. With millions of people waiting for insurers to see them for who they are, it is time for the industry to take a closer look. RGAS is seeking carrier partners to implement rLinkage and develop additional digital sales and marketing solutions. 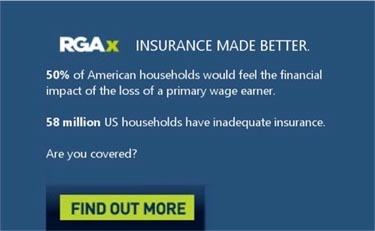 For a free consultation, contact RGAX today. 1 Customer sentiment survey conducted by Boston Consulting Group in eight countries (US, Japan, Germany, France, UK, Italy, Spain and Australia). Donna Jermer is Vice President, Distribution Lead for RGAX. She is setting and building the strategic foundation for development and execution of RGAX’s innovative distribution initiatives, including the building of life distribution capabilities, agency services and ongoing distribution operations. Donna has more than 20 years of strategic marketing experience in multiple industries from financial services and consumer goods to retail.